Sweden’s Patrik Jaerbyn (left) and America’s Chad Fleischer (right) run head-to-head in the Legends Giant Slalom during the American Ski Classic (VVF photo). Ski racers and wannabes from all walks of life will crank down the bindings and stoke the competitive fires March 19-23 as the 2014 Korbel American Ski Classic descends on Vail Mountain’s Golden Peak for five days of thrills, chills and spills, not to mention a healthy dose of good old fashioned spring fun. Marked by days filled with fast and furious ski racing action, along with off-hill festivities and gala celebrations, the 2014 Korbel American Ski Classic races will officially get underway Wednesday, March 19, with the fifth installment of the Conway Cup Community Race, presented by Korbel. 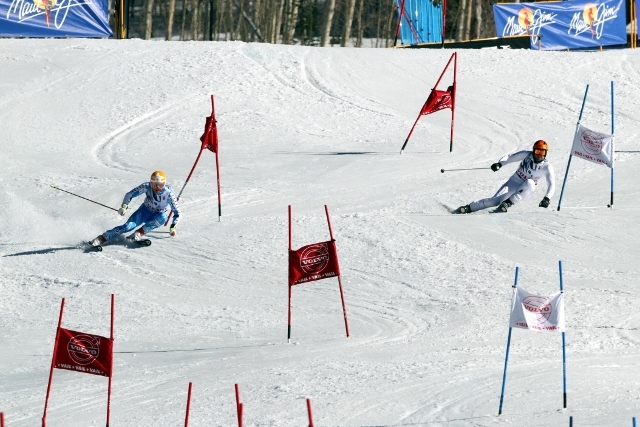 Competition action will also include the Legends Giant Slalom March 20, Korbel Ford Cup celebrity team competition March 21-22, Future Legends Race on March 21 and the Battle of the Legends Relay race bringing down the curtain for the on-hill activities on the afternoon of March 22. The festivities off the racecourse will be equally enjoyable, with the Gorsuch Tea Dance, sixth annual Hold ‘Em for Hope benefit dinner and auction and the Legends of Skiing Banquet. The 2014 Korbel American Ski Classic will kick off on Wednesday, March 19, with the Conway Cup Community Race, presented by Korbel. Named and run in memory of Dan Conway, this annual rite of spring is a rollicking good afternoon of racing and partying, with four individual racers earning the right to advance to a spot in the Korbel Ford Cup celebrity team competition March 21-22. Up next will be the Legends Giant Slalom on Thursday evening, March 20, a head-to-head competition, featuring some of the greatest names in ski racing history. Past Olympians and World Champions will rekindle old rivalries on the racecourse as five generations of skiing legends collide for the right to once again stand on the top step of the podium. The legends will need to be sure not to leave too much on the GS course, however, as they move into the role of team captains for the final two days of the Korbel American Ski Classic as the Korbel Ford Cup celebrity team competition takes center stage on Friday, March 21, and Saturday, March 22. Five-member teams will attempt to work their way through a maze of head-to-head competition over the course of the two days, emerging with not only the team title, but a year’s worth of bragging rights to boot. Participants and guests will once again have the opportunity to showcase their casino prowess Friday evening as the annual “Hold ‘em for Hope” benefit dinner and auction headlines the evening’s festivities. Hosted at the Vail Marriott Resort and Spa, the evening features a Vegas-style buffet, auctions and an array of casino games. A very special ceremony will round out the Korbel American Ski Classic social festivities Saturday evening as the greatest female skier of all time is honored when Austria’s Annemarie Moser-Proell is inducted into the International Ski Hall of Fame at the Legends Banquet. Moser-Proell dominated her competition during the 1970s, winning six Overall World Cup titles, including five consecutive season-long crowns from 1971-75. During the course of her 12-year World Cup career, she amassed a record 62 individual World Cup career victories, more than any other female winter sports athlete. In addition, she accounted for six World Championship medals, four of them gold, along with a trio of Olympic medals. The 2014 Korbel American Ski Classic is a project of the Vail Valley Foundation. For additional information on the Ski Classic or the Foundation, visit www.vvf.org.